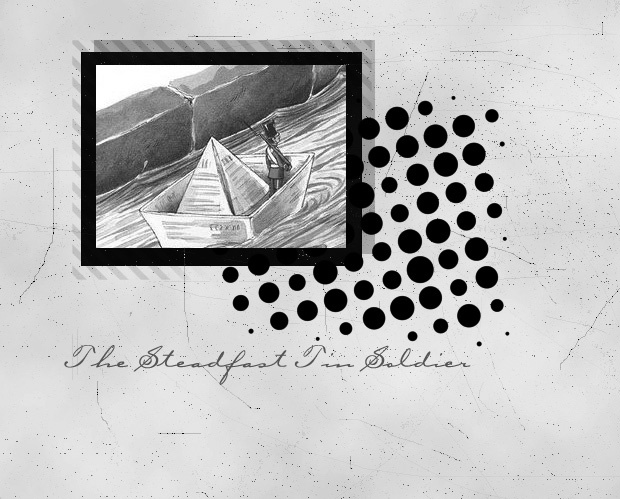 The Steadfast Tin Soldier is a literary fairy tale by Hans Christian Andersen about a tin soldier and his love for a paper ballerina. After several adventures, the tin soldier perishes in a fire with the ballerina. The tale was Andersen�s first not based upon a folk tale or a literary model. "The Steadfast Tin Soldier" has been adapted to various media including ballet and animated film. On his birthday, a boy receives a set of 25 toy soldiers and arrays them on a table top. One soldier stands on a single leg, having been the last one cast from an old tin spoon. Nearby, he spies a paper ballerina with a spangle on her sash. She too is standing on one leg and the soldier falls in love. That night, a troll among the toys angrily warns the soldier to take his eyes off the ballerina, but the soldier ignores him. The next day, the soldier falls from a windowsill (presumably the work of the troll) and lands in the street. Two boys find the soldier, place him in a paper boat, and set him sailing in the gutter. The boat and its passenger wash into a storm drain, where a rat demands the soldier pay a toll. Sailing on, the boat is washed into a canal, where the tin soldier is swallowed by a fish. When the fish is caught and cut open, the tin soldier finds himself once again on the table top before the ballerina. Inexplicably, a boy throws the tin soldier into the fire. A draught blows the ballerina into the fire with him; she is consumed at once but her spangle remains. The tin soldier melts into the shape of a heart. Ub Iwerks did a 1934 Cinecolor cartoon The Brave Tin Soldier that features an evil jack in the box. Mike Mignola's graphic novel Baltimore, or The Steadfast Tin Soldier and the Vampire fuses the poignancy of "The Steadfast Tin Soldier" with supernatural Dracula myths, set in a post-World War I environment. Kate DiCamillo's The Miraculous Journey of Edward Tulane (2006) makes use of the tale's themes. In Disney's animated Fantasia 2000, an adaptation of the tale is set to the first movement of the Piano Concerto No. 2 in F Major by Dmitri Shostakovich. The segment differs slightly from Andersen's tale: the ballerina appears to be made of porcelain; the soldier is disappointed to discover the ballerina has two legs, but the ballerina still accepts him; at the end, the Jack-in-the-Box villain is the one that perishes in the fire instead of the soldier and ballerina. My mom and I read this story when I was young in a book called "The Emperor's New Clothes", which I've since tried so hard to find, and it is one of my favorite stories ever.